iPhone 7 Price, Review, Deals, Cost, & Sales! Home / Compare Cell Phones / iPhone 7 Price, Review, Deals, Cost, & Sales! With the iPhone’s first 12 megapixel (MP) camera and a new, faster processor, the iPhone 7 makes a powerful leap forward from the iPhone 6s. The iPhone 7 has a compact 4.7” Retina HD display that makes it easy to read and view web pages, apps, and more. This iPhone’s oleophobic coating means that you won’t leave behind fingerprint marks after tapping on the screen throughout the day. The iPhone 7’s 12 MP camera allows you to take stunning pictures and sharp videos anywhere you go. This iPhone was the first to be built with Quad LED True Tone Flash, an improved camera flash technology. Optical image stabilization, which isn’t available on the iPhone 6s, is also a standard feature on all iPhone 7s. The iPhone 7 models come in two different storage capacity variations: 32 GB and 128 GB. With that much storage space, you shouldn’t have a problem downloading all your most favorite apps, movies, songs, podcasts, and more. The iPhone 7 was the first model of Apple’s flagship product to feature dual stereo speakers — one to the right of the Lightning port and one to the right FaceTime camera. 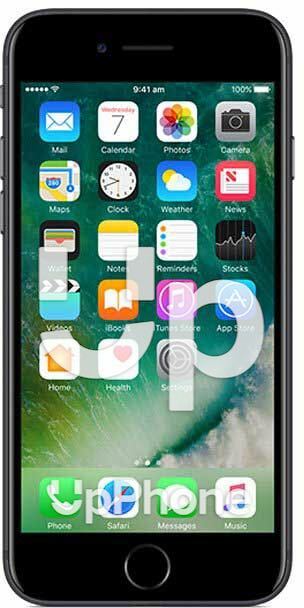 With stereo speakers, your iPhone 7 is capable of playing music with better sound quality than the speakers of the iPhone 6s. Like some previous models, the iPhone 7 has a Touch ID fingerprint sensor built in to its Home button. The Home button will recognize any of your unique fingerprints, which can be used to unlock your iPhone, confirm app installations or purchases, and plenty more! At the time of the iPhone 7’s release, its A10 Fusion chip was the most powerful processor on the market. Embedded in this chip is the M10 motion coprocessor, which was also a step up from the M9 motion coprocessor in the 6s. The iPhone 7 has a noticeably longer battery life than the iPhones that came before it. A fully-charged iPhone 7 will give you up to 13 hours of wireless video playback, 14 hours of internet usage on Wi-Fi, 14 hours of wireless calling on a 3G network, and up to 40 hours of wireless audio playback. The iPhone 7 was the first to receive an Ingress Protection rating of IP67. This means that it’s completely dust-resistant as well as water-resistant if submerged up to 1 meter (~3 feet) in water. Although this iPhone is water-resistant, we don’t recommend taking it for a swim! The iPhone 7 has an IP rating of IP67, meaning it's dust and water-resistant. The iPhone 7 was the first iPhone built without a headphone jack. The iPhone 7 was the first iPhone to be offered in “jet black”. The iPhone 7’s Home button isn’t a physical Home button like previous iPhones — it provides a haptic feedback that makes it feel like a button. The iPhone 7 and 7 Plus were the first iPhones to have dual stereo speakers. The iPhone 7 was the first non-Plus model to have a camera with optical image stabilization.